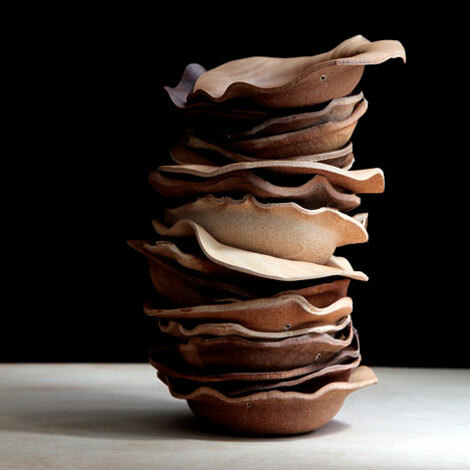 ... bowls made from boiled leather by simon hasan. stacked together like so is a sculpture on its own, don't you think? at first, I thought these were chocolates...and saw that they are bowls! Very organic and pretty! wow - i love it (or them)! Oh my. Absolutely gorgeous. I create recycled leather handbags and just got my hands on some beautiful leather remnants. Think I may have to research how to boil leather. Somehow, I'm thinking it's beyond my ability and that is why he's the artist, right? The photo is a stand alone work of art as well.